(15apr07) This issue will rerun an old rowing essay. It will continue in the next issue. THE REND LAKE MESSABOUT WILL TAKE PLACE ON JUNE 8 and 9 AT THE GUN CREEK RECREATION AREA AT REND LAKE IN SOUTHERN ILLINOIS. MORE DETAILS WILL FOLLOW BUT IT MIGHT BE PRUDENT TO MAKE CAMPING RESERVATIONS IF YOU INTEND TO ATTEND. One of Brian Gardner's two Totos goes for a paddle in England. I decided to rerun these rowing articles that first appeared here in the winter of 98-99. I've left out some of the details that appeared in those issues and added other details. This essay will explore mostly the simple, cheap, relaxed and enjoyable side of the sport and doesn't cover sliding seats or sliding riggers or forward facing rowing, things that I haven't tried myself. Figure 1 shows a fixed seat rower. 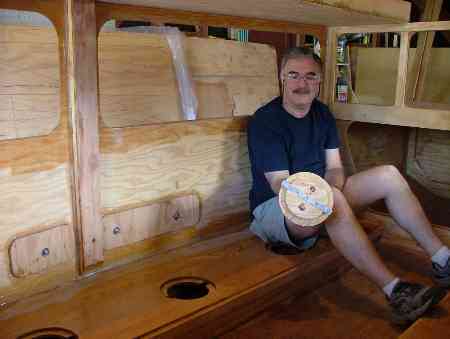 His rear is attached to the boat by friction to the seat. His feet should be braced against solid foot braces. The handles of the oars are usually about chest high, or slightly below, when he pulls. The oar handles may overlap each other during some portions of the pull, although it's more comfortable for the casual rower if they don't. The oars are held to the boat by common pivoting oarlocks. They are somewhat free to slide in and out of the locks such that the distance from lock to handle can be adjusted. The blades of the oars are dipped into the water with each power stroke and lifted clear with each return stroke. Here is what the oars do: In effect they are levers that gear up the speed of the rower's hands. Most people in a good (but not racing) row boat will pull at 25 to 30 strokes per minute. Let's say it's 30 strokes per minute (2 seconds per stroke) to make the figuring easy. And let's say that stroke consists of 1 second of power and 1 second of recovery. If the rower pulls the oar handles through 3 feet with each pull, as shown in Figure 1, then the oar handles are moving 3 feet per second, which is 2 miles per hour. If the oar were 84" long (7 feet), and 56" of that were outside the lock, and 28" were inside the lock, then a 2 to 1 ratio will be achieved. Indeed the classic recommendation for locating the oarlock pivot on the oar is 17/25 th's from the tip. Figure of 3 shows the "freebody" diagrams (the balance of forces) of the oar and the rower and the boat. With the configuration shown the 9 pound load on each handle is balanced by a 4.5 pound load on each blade. So the process of gearing up the speed by a factor of 2 has also reduced the balance load on the blade of the oar by a factor of 2. The forces on the rower's body are also shown in Figure 3. His 18 pounds of force in his hands must be reacted to the boat some way. If he has no feet bracing at all, then the force goes out of his body as friction where he sits. It can hurt a bit after a while! The usual solution is to brace the feet solidly. A handy bulkhead or hull frame might do. Custom cleats for the feet to push against attached to the hull are also common. If the rower now turns downwind he may find his power will push the boat at 5 mph. To get that without changing his stroke he can slide the oars out so that he has 24" inboard and 60" outboards. As shown in Figure 3 he will now have 3.6 pounds of force at the blade of the oar. Less force is required there now since the wind is helping to push the boat along. Now let's imagine the rower encounters a headwind that slows the boat to 3 mph. How does he match his intermitant power to the new speed? If the rower slides the oars in so that 32" is inboard of the locks and 52" is outboard, his 2mph, 9 pound application at each handle will be geared up to 3.2mph at the blades. As shown in Figure 4 the blade will balance now with 5.5 pounds of force at the blade. That's an increase over the first condition and it's that extra blade force that will help push through the headwind. One can see from the above discussion that rowlocks that are pinned to the oars in one position don't allow this change of gears, so to speak. By moving the oars in and out over an 8" range we have "regeared" the boat speed to vary over 50% without changing the handle force or speed. And one can see that the total length of the oar might not really enter into the above discussion, only the location of the pivot point effects the gearing of the oar. But the length of the oar does have effects. The longer the oar the less of an angle it will sweep through and the more efficient it becomes. 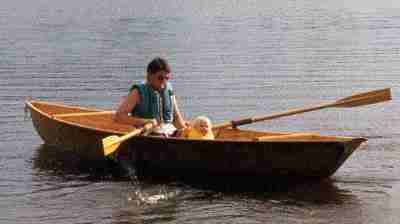 Also the oar must be long enough so that the handles fall conveniently at the hands. But an overly long oar can be a problem, too. An overlap of the handles that many might find very awkward will develop. And the long oars may simply be a bother in confined rowing areas. 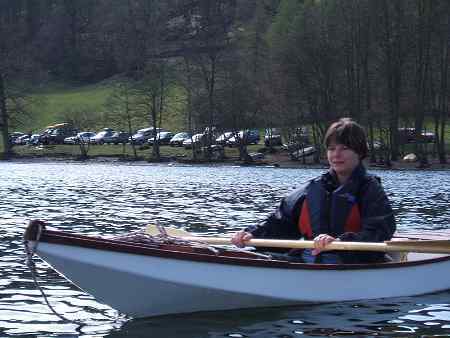 The general rule for the length of oars is about twice the beam of the boat. But if you apply that rule blindly sometimes silly things can happen. I recall the question being asked on a news group, the boat being a 9' dink with a 5' beam. All the first answerers replied that the proper oar length for the boat was 10', and next came all sorts of questions about how to make the oars break apart so they could be stored in that short boat. Finally someone wrote in that the responders were all really long on theory and short on common sense. A short wide boat like that is never going to be fast, something like 7' oars would be plenty. Here is how I look at it. The classic lock location of 68% in from the tip is a very good starting spot, but not sacred. For a 7' oar that would be 27" from the pivot to the handle end. I think most of us can row Ok with handles overlapping about 6" to having them apart about the width of our shoulders, say 20". So to me a 7' oar might do well with boats ranging from 48" to 74" oarlock spread. Quite a variety! So I've used the same 7' oars on everything from my 7' WeeVee dink to a 24' Birdwatcher and they were just right for both. Oars shorter than say 6' swing through inefficient angles for the normal rower and I'd avoid them. I've never used oars longer than 7' although some boats might need them. With longer oars one must be very careful that they are well balanced such that you aren't fighting the weight of the blades with every stroke. Factory oars are seldom well balanced and that is one reason they can be really miserable. I'll tell a Phil Bolger story about the subject to show how important the balance is. 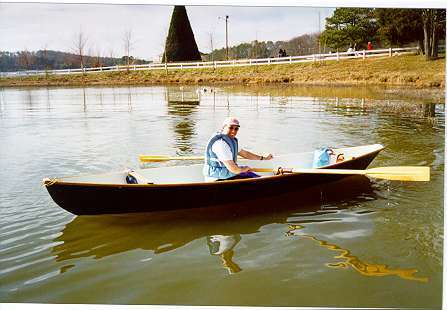 In the early 90's Phil had built a lapstrake rowing boat for his own use and had custom 9' spoon bladed oars made for it. He said they were miserable. One day he clamped lead weights to the handles with hose clamps to balance those oars. Then they were beautiful! A complete transition in a few minutes of work. The boat is called Spur II and is in Phil's book "Boats With An Open Mind". He points out that adding lead weights on the inside of the pivot allowed him to cheat on the 17/25 classic rule, sliding the oar more outboard and "gearing up" the action as we mentioned earlier. Another factor to consider is the height of the oarlocks above the water. The higher up, the more the oars slant down and that is not good for effecient rowing. The Birdwatcher rowed quite well for such a large barge and I think that was mostly because it had oarports about 10" above the water which gave excellent rowing geometry with 7' oars. So I draw oarports on my designs all the time but hardly anyone builds them in. Those who do will be satisfied with the rowing. Those who think they are going to row well from a 30" high freeboard, or with a canoe paddle, better not have far to go. But the high freeboard would be a case for a long oar. Another very practical consideration is storing the oars in the boat, as with the guy with the dink. 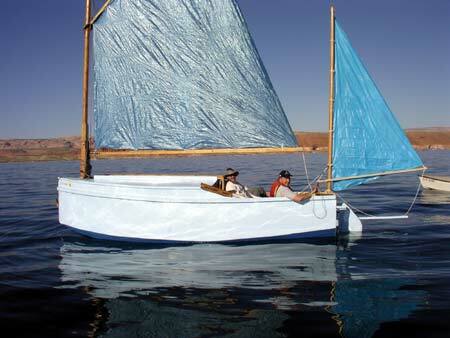 My second homemade boat was a Bolger Jinni with a 6-1/2' long cockpit. Bolger recommended 7' oars and that is what I started with. In order to stow those oars in the cockpit I had to cut holes in the aft bulkhead (not watertight so it wasn't a problem that way) to accept the oar handles, and then those 7' oars fell right in place. Later when I made Piccup Pram, which also had a 6-1/2' cockpit, but solid bulkheads at each end, I went to 6-1/2' oars for storage in the cockpit. But guess what! At times the oars would jamb really tightly between those bulkheads. The solution was to cut just 1" off the handles. They never jambed again. We'll make some home made rowing gear, oars, sockets, and a rowing seat. 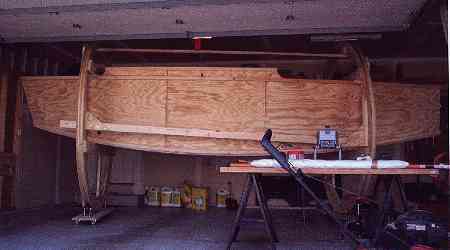 Sportdory is an attempt to improve upon the Bolger/Payson dory I built about 15 years ago. This boat is slightly smaller than my old dory. In particular the bow is lower in hopes of cutting windage. the stern is mostly similar. The center cross section is about identical. 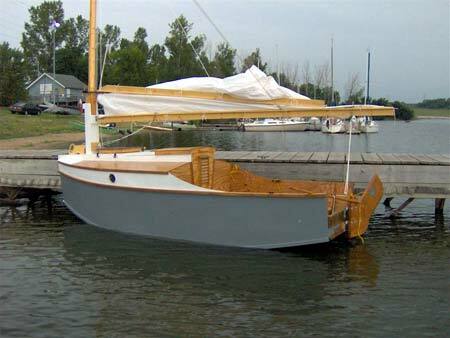 This boat has slightly more rocker than the original Bolger dory. 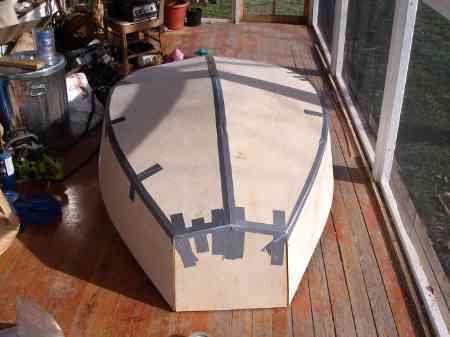 The hull is quite simple and light, taped seam from three sheets of 1/4" plywood, totally open with no frames. The wales are doubled 3/4" x 1-1/2" pieces to avoid the wale flexing my first boat had. I've added an aft brace to stiffen it up and give the passenger a back rest. Mine once covered 16 statue miles in four hours. In rough water you will feel the waves are about to come on board but they won't. But if you try to stand up in one it will throw you out with no prayer of reentry. The prototype was built by John Bell of Kennesaw, Georgia. 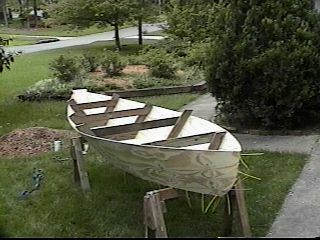 Here is a photo of John's Sportdory under construction. You can see the sides and bottom, precut to shapes shown on the plans, wrapped around temporary forms and "stitched" together with nylon wire ties in this case. I'm quite certain that with this design one must leave the forms in place until all the structural elements like the wales and cross bracing have been permanently installed. If they are removed before then, the assembly will change shape and you won't get the same boat. In particular I think the nose will droop to no one's benefit. One might wonder about a comparison of Sportdory, Roar2 and QT. They are all about the same size and weight, a size and weight I've found ideal for the normal guy. They are small enough to be manhandled solo yet large enough to float two adults if needed. They are all light and well shaped for solo cartopping. Roar2 is probably the most involved to build and the best all around of the three. Sportdory is simpler and lighter, at least as fast and as seaworthy, but most likely will feel a little more tippy and less secure. You shouldn't really try standing up in either of these two. QT will be the least able of the three as far as speed and seaworthiness but may be the easiest and cheapest of the three and is stable enough to stand up in. So take your pick. HOLY COW! 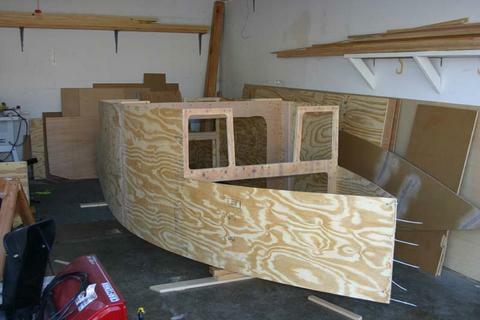 A Jukebox2 takes shape in Minnesota. Unheated shop means no work during the winter. Check out that building rig! And the Vole in New York. Going very quickly but most likely there will be little more done during the cold winter.